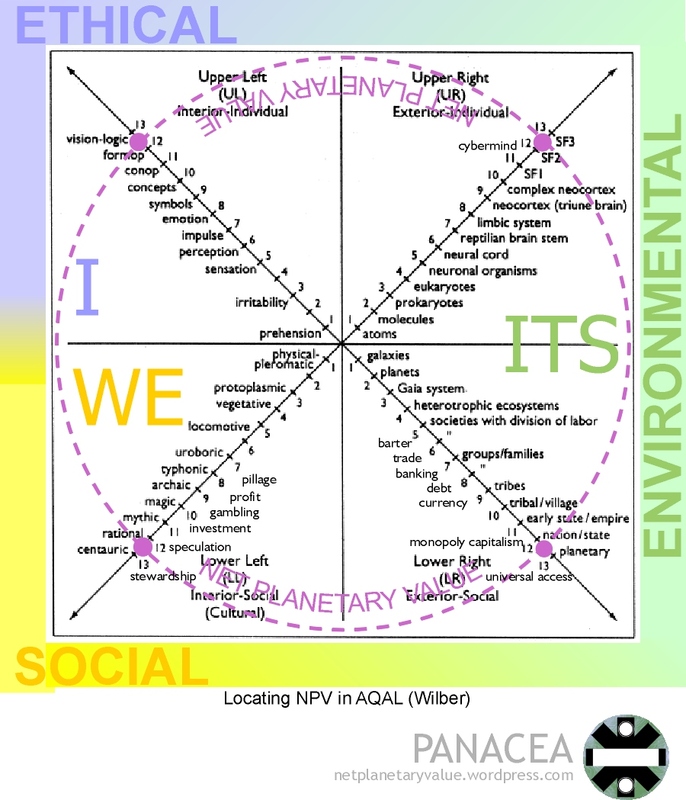 Ken Wilber’s All Quadrant All Levels (AQAL) schematic provides an appropriate cosmological framework to demonstrate how NPV integrates into life as it is, and will likely become. The evolutionary impulse has brought us to the present point which can be a pivot allowing a transition to a different stage. As we transcend to another level, we include all of the gains realized from previous levels. This is the way of holons in a holarchy. The value index preserves and facilitates the ethical standards of equality, equity, justice and transparency. Socially, we nurture and provide for the least among us, while providing the space and resources for the full blossoming of human nature. Structurally, the environment is preserved and protected, resources are rationally managed, and institutions expand support for the best in learning, training, housing and healthcare, with the technological innovation that is part of our evolutionary response. The paragraph following right after sums up the second-tier yellow and turquoise memes, the final levels of the Spiral.